The first part and majority of this book deals with marked cards. It shows numerous examples of how and where to mark various back designs popular during the early 20th century in the United States. The second part briefly describes sleight-of-hand for the card cheater such as second dealing, bottom dealing, shuffling, false cuts, and mechanical hold outs. Each technique is illustrated with a photo, which is quite remarkable for a book from that time. The third and final part deals with the mathematical odds of draw poker. 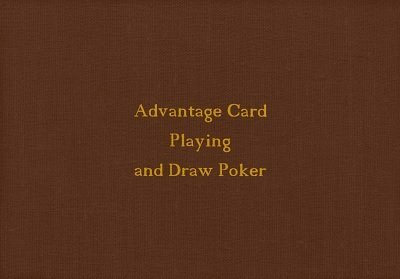 Some people believe that F. R. Ritter might be S. W. Erdnase, the unknown author of Expert at the Card Table , which was published three years earlier than this book in 1902. Another historically interesting fact is that this is likely the book Dai Vernon "mistook" for Expert at the Card Table when his father brought it home from work to show him as a young boy. 1st edition 1905, 117 pages; digital edition colorized.